Using Shortcut Manager, you can assign keyboard shortcuts to existing ribbon buttons even if they don't appear in the Excel user interface. Excel has a number of commands that are not readily available from its user interface. 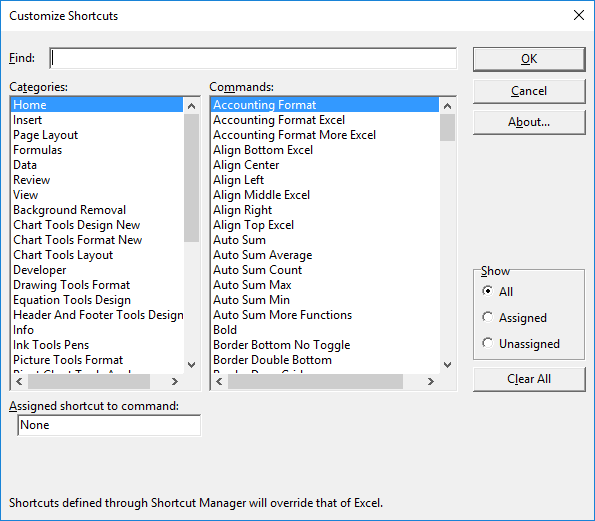 Shortcut Manager for Excel surfaces those and allows you to define keyboard shortcuts to invoke these commands. Many of these commands are active only for a certain context. Shortcut Manager invokes these commands during these contexts only. Click here to download the addin.